Access to Media’s showing thanks this November with our Gobble Up The Goodies Giveaway. Simply click on the image to Like our Facebook page and like and share this post between 11/1 & 11/15 and you’re entered in to win this basket of goodies and a gift card to have thanksgiving dinner on us. 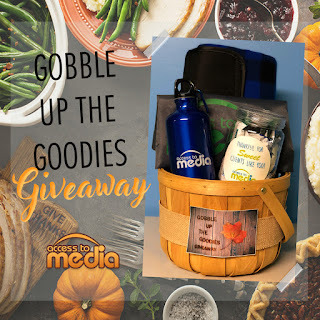 Happy Gobbling from your friends at Access to Media!!! Good Luck! "A recent article in Ad Age speaks to the appeal of dollar savings through programmatic buying; iHeartRadio is looking into streamlining ad buying with Programmatic Radio." "During the 4th quarter there is a great deal of competition for media space across a wide variety of options; national print, radio and television come to mind, yet, there are local bargains to be had as well as national remnant buys especially in the frenzy of holiday buying..."
Congratulations to our VP of Sales and Marketing, Liz Jusko, for 20 years of hard work and dedication! Liz started Access To Media with a very clear vision in mind. She wanted to build a business where all companies, big and small, would be able to receive the highest quality marketing services. Thank you Liz for everything you do from your entire staff at Access to Media. Refer a friend and if any of your referrals become a client of ours, we will give you $100!